In several courses that I am doing in this semester – most of them related to marketing field – Marketing Strategy, Data Driven Marketing, Consumer Behavior and one of my favorite – Design thinking, there is one underlying theme – “Customer”. It should not be surprising because in today’s world customers have lot of power in their hand and businesses make money by delighting their customers. The way companies sell enterprise software products over the years have undergone significant changes. One such change is Software as a Service (SaaS). In such business models, the service providers generate revenue through subscriptions. It is very different from traditional models, where service providers used to just charge upfront for the services and then go through installation. A subscription model gives customers flexibility to terminate their subscription if they are not satisfied. This has made companies to improve their customer support and constantly innovate to provide best services so that they can avoid customers switching to their competitors. In order to track growth and performance, companies keep track of several metrics which measure subscriber growth, revenue generation and long term value of its customers. If someone asks you, how long customers are staying with the firm, then with the above churn rate you can say 33 months (using 1/3%). Now, to measure CLV’s sensitivity to churn rate, let’s just change the churn rate by only 0.2%. We see that if the churn rate decreases from 3% to 2.8%, the CLV jumps to $10,000 from $9,333, which is an increase of $667. If we were to use the MRR lever to have the similar jump in CLV, keeping others constant then the MRR should increase from $400 to $429, a change of around 7%. Clearly, this shows that churn rate is much powerful lever to move CLV. This help us prove that customer retention is very important to build a sustainable business. That is where the idea of “Customer Success” comes into the picture. It is important to acquire new customers, but what is even more important and often neglected is to retain customers. Especially in startups when the focus is on acquiring more and more customers, the company can drive more value and avoid need to raise more capital by making sure that they are able to retain as many customers as possible. Companies have realized the importance of post-sale relationship with customers and have started focusing on customer success. I looked for “customer success” on Google Trends just to find out the level of interest on this topic. From the above chart, we can see that in the last one year there has been a surge of more than 40%. This shows that people are increasingly looking for “Customer Success” as an approach to drive retention and mitigate churn. Many companies these days have customer success managers (CSM) and all the way up they have Chief Customer Officer. Customer Success Manager’s job is to establish an enduring relationship of the company with the customer. Note that they come into picture post-sales. CSM must be proactively reaching out to customer when they find that customer’s product adoption is decreasing, which could mean that they are at a risk of churn. On the other hand, if CSM finds out that the customer seems to be engaged and really happy with the product, they could try to up-sell, which will increase the MRR. Any business grows in four ways – Acquisition, Retention, Up-sell, Cross-Sell. In the early stage, companies mostly focus on acquisition, but hopefully through the argument I made above I was able to make a point that retention is equally important if not more. This new wave of “Customer Success” is step towards addressing churn and creating more happy customers. Last week, I along with my team from Design Thinking class organized a workshop to introduce students to Design Thinking and also have them participate in the Open IDEO’s “The Higher Ed Challenge”. The details of the challenge could be found on the Open IDEO website. Design Thinking is a five steps process with significant effort going in the “Empathize”, “Define” and “Test” steps, but due to the limited time we had to conduct this workshop and also since we were already given the problem by Open IDEO, we focused on “Ideate” and “Prototype” steps. We gave students around 20 minutes to brainstorm ideas for solving the given problems. In order to help students brainstorm in a productive manner, we showed them a demo brainstorm process for “how to improve our school cafeteria”. We wanted them to have constructive brainstorming not destructive. We shared 7 rules to facilitate collaborative brainstorming. Then we asked them to vote on the idea they would like to prototype. For prototyping, we brought all sorts of art and craft stuff. We gave them 30 minutes to build a prototype. They could draw, cut/paste, build mock ups – anything that could help get the idea across. We had four teams with 4-5 members. Each team came up with very creative and thoughtful solutions. We also made videos of students describing their ideas. Finally, we uploaded the ideas along with their description, pictures and videos to the Open IDEO website. Everybody had a lot of fun working with students from different schools at Cornell. We also enjoyed sharing our learning from the Design Thinking course. I think teaching makes you even better learner as it forces you understand the concepts and ideas to their depth, so that when someone ask you questions, you are well prepared and confident. I would like to thank our instructor for this course – Tracy Brandenburg, teammates and participating students to make it a memorable experience. As a preparation for this class, we were supposed to interview an Airbnb host in Ithaca. My team interviewed a superhost. A superhost is someone who has excellent track record in hosting guests with 5-star reviews. Through the interviews we tried to understand how the host uses Airbnb to show his listings and what does he look for while approving a reservation request from a guest. The superhost shared several examples of the guest profiles that he has rejected in the past and also highlighted few reservations request that he approved instantaneously. We also looked from a guest’s point of view to get a sense of the on-boarding and reservation process. We went outside the class to find someone who has never used Airbnb and help her setup an Airbnb profile. We walked her step by step through the process to understand what she was thinking while filling up information – what made her uncomfortable in sharing any specific information and what sections were not very clear in their purpose. One important observation from this exercise was that users generally try to share as little information as possible about themselves. We think this is probably the biggest obstacle in building trust and safety between guests and hosts. From our interviews, we have found both guests and hosts complaining about profiles and listings that look sketchy because users do not share enough information to better understand them and build trust. After interviewing several hosts and guests, we decided to select one whose problem we would like to solve. My team selected the superhost we interviewed. First step was to define the problem statement. In defining the problem we had to think about the root cause because sometimes what we see are just symptoms. After finalizing the problem statement, the next step was to brainstorm solutions. Brainstorming process has certain nuances. First, each person in the team takes a minute to write down an idea and announce it with pasting the sticky note on the wall with their idea. No one is supposed to criticize other person’s solution. Once all have posted an idea, team members build on top of the idea they like. For example – you don’t say “I don’t like that”, instead say something like “That’s great – may be we could also…”. You have to be constructive not destructive. If the team has multiple solutions, then they vote to determine which idea they would use to build the prototype. Finally, the team does rapid prototyping using anything – art and craft material, cardboard, paper, etc. May be in a more professional set up such as at your job you might build prototype using some tools and technologies, but in the classroom the aim is to help others get some idea about the solution that the team is proposing. The teams also play roles to enact the problem and solution to show how it will look like in the real world. For my course this semester, each team build a prototype and we made a video of teams acting out the solutions using their prototypes. It was a very fun and learning experience. For this class, we were asked to bring photographs of things we carry everyday, spaces or things that we care about, and something that makes us happy. During the class professor asked us to stick those pictures on the wall. Then your team members would try to guess what those pictures mean; basically try to understand people through their interests, habits and things they value. One person said that his team members were able to point out certain things about him that were true but he never himself has consciously thought about it. I think this activity was a great exercise to use your vision to interpret things and you will be surprised how much you can guess correctly because picture speaks a thousand words. For the second activity, the professor first showed us a hack that someone has put in a park to create a sitting place. It was a park, but did not have any place to sit. Using that as an example, the professor then asked us to go outside the classroom and look around the University for any hacks or workarounds that people have created or anything that you find interesting such as people using a rock as a sitting platform near a water stream, a painting to cover up a broken window or a chain fence to lock a bicycle. We took the pictures of all such things and emailed to professor. We all came back after 20 minutes and went through the pictures that teams have sent to the professor. We tried to interpret what people were trying to achieve in those pictures. I think I idea behind the exercise was to pay attention to the way people interact with their environment because many times they do not explicitly say what their paint points are, but you could discover an important problem through your observations and find a great opportunity to create products and solutions. The third activity was to learn how to interview someone. The professor first showed us an example of a bad way and a good way to do an interview using a mock interview with one of the student. As part of the activity, we were supposed to go outside the class and find someone who has used Airbnb. In the process have one person ask questions, another take notes and others observe the body language of the person being interviewed to get subtle understanding of the person feelings when they booked and stayed at an Airbnb listing. He said the interview should be like a conversation, where the other person feel comfortable in sharing his or her experience. The questions should be open-ended and not the ones that have “yes” or “no” answer. A great way to interview is to ask the person to recall the last time they used Airbnb and what their experience was like. Then ask questions with an intrigue to show that you are interested in learning more.The professor shared an important thing about whom should we select to interview. He said usually the people who are on the extreme ends provide good insight; I mean person who either had a great experience or a horrible one. Finally, everybody went with their teams and interviewed an Airbnb guest. It took us some time to find a person who has used Airbnb. I was surprised not many students have used Airbnb or may be I was unlucky that day. We managed to find someone when only 10 minutes were left before we were supposed to be back in class. But we were able to ask questions and learn about her experience using the methodologies that professor shared in class. Overall, it was a very useful class and I very much enjoyed learning by doing. Would I have to provide the time by when I can come and pick up the coffee? Or Would the app tell me the pick up time? These are two different use cases. The first use case looks like the traditional way of booking a cab, when you provide the cab a time to pick you up. The second one is more like an Uber, when you need the cab right now, so the closest one would take your order and provide you a time estimate of its arrival. Assuming that people don’t really plan to have coffee and decide in the instant, and also since there are usually many Starbucks and other coffee shops, the second use case seems to be most probable. Anyways, I decided to use the “order & pay” the next day when I was half a mile away from Starbucks. 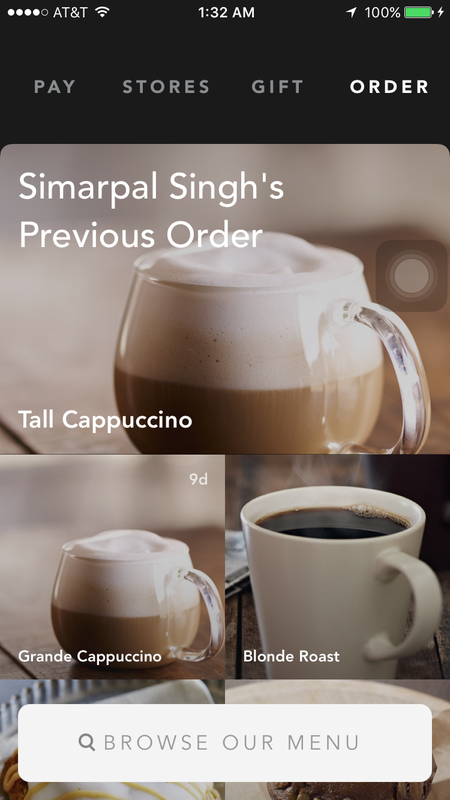 When you go to the ordering section of the app, it displays tiles with images of your previous orders, so you can instantly place an order. It also has a browse search bar, where you can go through different types of coffee, other drinks and even food items. It has the default size of Grande for the drinks, but you can change that. After you select the item, on the next screen it tells you the estimated time to pick up from the closest open store, which BTW you can change in case you want to drive to a different location. It also displays your drive time to that store. Finally, you can place the order. But I have one concern here. The pick-up estimate time is usually in a range, for example 3-8 minutes. Now, if it will take me 10 minutes to reach the shop and the coffee is prepared in the next 3 minutes, then by the time I reach, my coffee might not be as hot as I wanted. It would have been great if they could take into account my arrival time to prepare coffee so that it is as fresh as ordered on the spot. Now, I know many people don’t really care if the coffee’s temperature has dropped slightly, but wouldn’t the experience would be awesome if they could achieve that precise level of timing. I think they are very much capable of actually doing that with the amount of data they are capturing.